You’ve just scrambled to the summit of a jagged, towering mountain. You’re exhilarated but exhausted. The trek to the top included a steep climb, an unexpected thunderstorm, and so many scrapes and bruises that you’re starting to wonder if instead of hiking the mountain you actually physically fought it. But you’ve made it. And now that you’re on the way down and your tent is in view, you have a granola bar and a freezing night on the cold hard ground to look forward to. You wish you had a gourmet meal, a craft beer, and a big, soft bed waiting for you instead. In other words, you wish you were glamping. If you’ve never been glamping, imagine all of the best things about camping—starlight, wilderness, alpenglow on the mountains—with a serious dose of luxury. Glamping (a portmanteau of the words "glamorous" and “camping”) allows you to experience nature without sacrificing comfortable accommodations, chef-prepared meals, and spa treatments. If you’re the kind of outdoor enthusiast who likes hitting the trail as much as you like hitting the sauna after a four-star dinner, these six U.S. glampgrounds are perfect for you. When most people picture Texas, they think of football, barbecue, and intensely strong state pride. Most people, it turns out, haven’t been to El Cosmico. Located deep in the West Texas desert near Big Bend National Park, El Cosmico is a glampground for bohemians, adventurers, and anyone else who has ever dreamed of sleeping inside a vintage pink trailer. 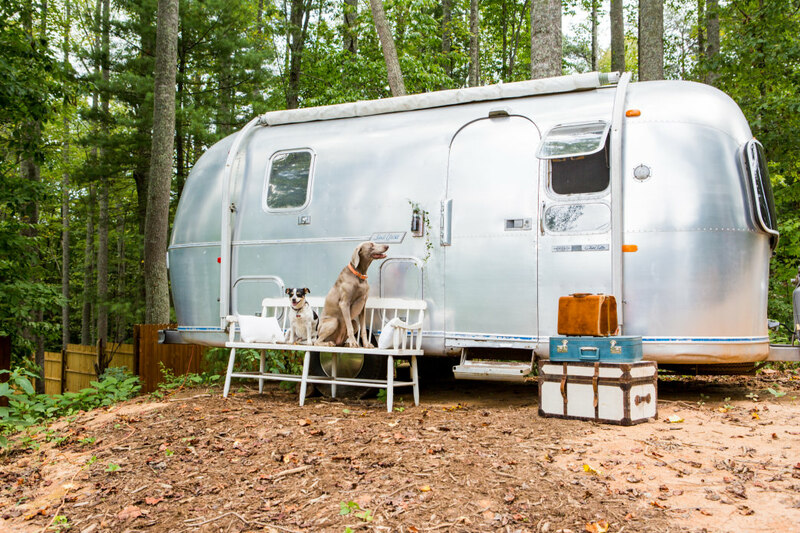 The refurbished trailers range from tiny (11 feet long) to Texas-sized (42 feet long) and include spacious decks, kitchens, and retro decorations. El Cosmico also rents out teepees, safari tents, and yurts. The property includes a hammock grove and a shop with curated goods and is the site of an annual music and art festival. Whether you want to float the Rio Grande, climb a 7,000-foot tall mountain, drive to weird desert art installations, or just ride a bike beneath the massive Texas sky, El Cosmico is the ideal jumping-off point. Perched on the dramatic cliffs of Big Sur, Treebones Resort is an essential glamping destination for travelers along California’s iconic Highway 1. The eco-resort was started by a Canadian couple who fell in love with camping in Big Sur so much that they wanted to share it with others. They created Treebones as an intimate glampground that honors the environment around it without imposing on it—but that doesn’t mean you’ll be sleeping in the dirt. Luxury accommodations include yurts with redwood decks and ocean views. There are also campsites that feature human nests (picture a giant bird’s nest). Haul your sleeping bag up, settle in and fall asleep to the sound of waves crashing on the beach below. For dinner, you’ll be treated to your choice of farm-to-table meals at an outdoor restaurant or a romantic dinner at a stylish sushi bar with omakase-style dining. Where is the most unique place you’ve ever slept? If your answer isn’t a wagon straight out of the Oregon Trail game, you’re missing out. Capitol Reef Resort offers a one-of-a-kind glamping opportunity in the form of their Conestoga Wagons. Based on 19th-century design, these "tents" sleep up to six guests. Other lodging options include teepees, cabins, and motel rooms (but you’re going to want to book one of the wagons). The resort is at the edge of Capitol Reef National Park and features panoramic views of red cliffs that transport guests back to the days of the Wild West. While you’re there, grab breakfast or dinner at an on-site restaurant, head to the nearby park, or book a llama adventure, which allows you to explore the desert wilderness with a llama at your side. Just because you’re going to Montana doesn’t mean you have to live like Lewis and Clark. You can still take in the glacial-carved valleys, tumbling waterfalls, and herds of bugling elk without getting lost in the forest. The Resort at Paws Up might actually be the exact opposite of roughing it. The ultra-luxury glampground, situated 30 miles east of Missoula and 135 miles south of Glacier National Park, is 37,000 acres of pristine Montana paradise. The year-round resort offers 36 tents—though your trusty North Face tent probably doesn’t feature 975 square feet and multiple bedrooms—with hardwood floors, air conditioning and heat, and soaking tubs. If you’re feeling rustic, you can enjoy a chuckwagon feast of fire-prepared steaks and asparagus cooked along the Blackfoot River. If you’re feeling fancy, you can head to the fine dining restaurant and savor a dinner prepared with Montana ingredients and paired with California wine. There’s even a resident s’moreologist who can help you create the perfect dessert with gourmet ingredients such as sea salt caramel and smoked salmon. Kennebunkport, Maine, is a place that evokes images of well-heeled folks who like sailing, croquet, lobster, and using the word "summer" as a verb. It’s the perfect location for Sandy Pines Campground, a glamping destination that combines elegance with seaside charm. Located among the pine trees and salty air at the edge of Goose Rocks Beach, Sandy Pines Campground offers various glamping options. You’ll find spacious tents with names like Seagrass and Nautical Nights, several of which are outfitted with vintage chandeliers. All tents offer 430 square feet of space, king beds, antique decorations, decks, and fire pits. There’s a general store, a snack bar that serves lobster, and ample opportunities to paddle the ocean or pedal your bike along the rocky coastline. The picturesque Smoky Mountain town of Asheville, North Carolina, is known for rolling green mountains, farm-to-table fare, and microbreweries. The town’s brand of hippie meets southern hipster makes for the perfect glampground site at Asheville Glamping. This glampground features refurbished trailers, teepees, yurts, safari tents, domes, and airstreams. 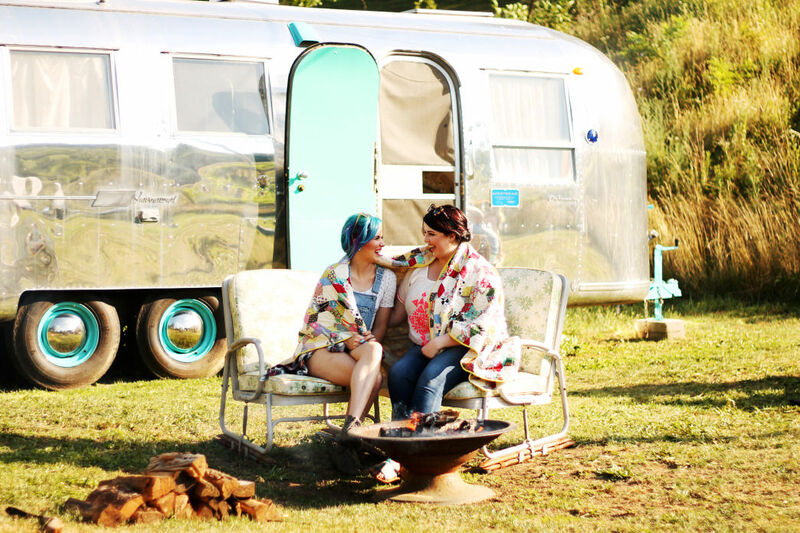 From the Silver Bettie (a vintage 31-foot trailer from 1955 with a four-person hot tub) to a hike-up safari tent that opens up to mountain views, there’s something for every kind of glamper, and the rates are reasonable enough to make this a luxury accommodation that everyone can afford. 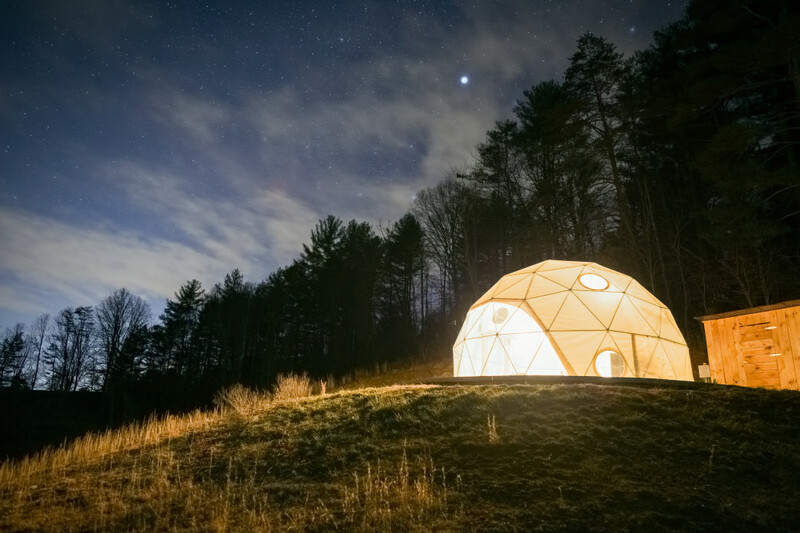 For the ultimate Asheville Glamping stay, rent one of the domes, which look like igloos but are as comfortable as fancy hotel rooms. Lay on your back on the queen-sized bed inside, watch the sunset, and then fall asleep counting the stars—no sleeping bag required.